Jose Isabel works with Quechua speaking people in the mountain region of Cajamarca, in the north of Peru. His village is situated some 18km outside of the city of Cajamarca, a city of 280,000 people. Jose works with a local church, teaching and discipling, and also travels to a number of outlying villages up to two days travel from his home, these villages previously had no churches or Christians. Jose Isabel is an evangelist with a passion to see the Quechua speaking people of his region come to know Christ as their Lord and Saviour. 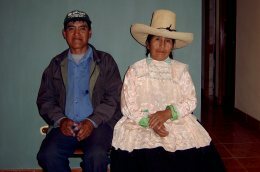 There are 19 different Quechua languages in Peru and Jose was involved in translating the Bible into the particular language of his region. Bright Hope’s relationship with Jose was initially as a partner but that changed some two years ago when Bright Hope financed a project for Jose, a small carpentry shop. The project has grown big enough to sustain both Jose and his wife in their missionary work as well as providing a living for Jose’s son and his wife and Jose’s daughter and her husband. There are also funds from the business that are made available for the local church and its outreach into the local community. Jose Isabel and his family. We are enthusiastic that this project provides a means for the Gospel to spread into formerly unreached villages in this region. A positive of the project is that it provides financial support for three married couples directly and a local church, to a lesser extent, indirectly. Another exciting thing about this project is that as a result of the evangelistic efforts of Jose Isabel churches are being planted in approximately 3 -4 remote villages and people have committed their lives to Christ. Bright Hope is most excited about this. Jose Isabel is married to Candelaria and they have three children. 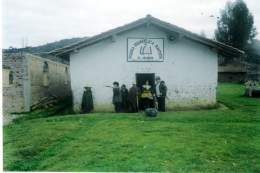 He is an elder in his local church in the village of Calvario, this is a Quechua speaking church. He and his family attend this church where his brother is also an elder. The church has commended Jose Isabel to evangelise and church plant in the towns and villages near to and further a field. Jose has been an elder there for longer than the time Bright Hope has known him, since 2001. Jose Isabel is partnered in the Lord’s work by his wife mainly although his son and daughter-in-law and his daughter and son-in-law also help out. Jose is backed by his local church who provide manpower when needed and constant prayer. The vision is to see new Christians in villages where there are none at present, also they desire to see churches established and the believers in these churches discipled and for them to reach their own people. Jose Isabel formulates a plan that sees him visiting the villages he has targeted in the region on a rotating basis. These visits need to be planned as some are two days travel away and that travel is not always by car sometimes they walk. As Jose Isabel is now self-supporting we are no longer sending any financial support to him.